Three-time champion jockey Richard Hughes failed to cap his farewell to racing with a victory on the final day of the Goodwood Festival. The 42-year-old, who has retired after 27 years in the saddle, came closest to success in Saturday's opening race when he finished second on 14-1 Barnet Fair. "I didn't have a winner, it wasn't to be, but I am overwhelmed by the whole thing," said the Irish Flat jockey. "I'm ready to retire. I am delighted to go out on a high." Hughes is one of the most decorated Flat jockeys of all time having recorded 31 Royal Ascot winners, two British Classics and numerous other Group One successes. His final race was the seven-furlong Qatar Stakes on board Fox Trotter, but despite being in contention with two furlongs to go, the pair finished fourth. 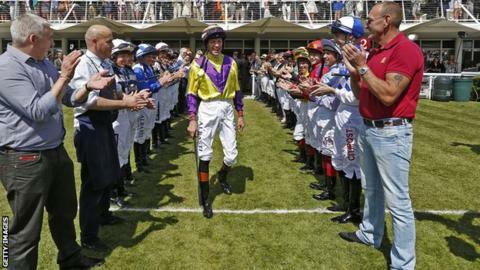 The Dublin-born rider, who was initially greeted by a guard of honour of jockeys as he entered the Goodwood parade ring, added: "A lot of jockeys retire in a hospital bed and I am very lucky. "It is just a huge relief and I can go on now. It is onwards and upwards to my next job [as a trainer]. "The other jockeys are like brothers and we have been through highs and lows all together. I was trying to be champion jockey this year, but next year is more important to me." Hughes did manage two wins at this year's Festival, in the Land Rover Stakes and then Friday's Betfred Supports Jack Berry House Nursery Stakes. "As a three-time champion jockey, the winner of a string of major races and a supreme stylist in the saddle, Hughes can walk tall - both literally and metaphorically - as one of racing's most significant recent figures."